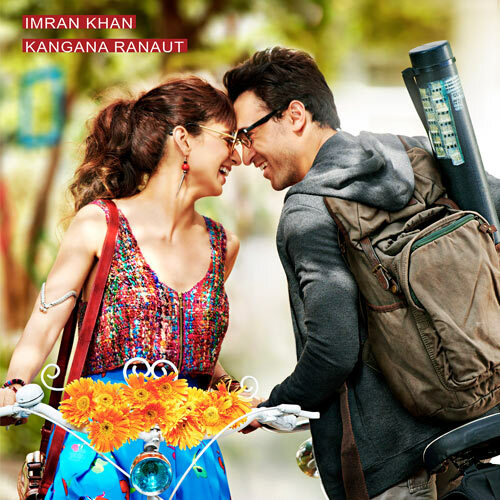 REVIEW: EVEN A RADIANT KANGANA CANNOT RESCUE KATTI BATTI! Katti Batti is infuriatingly indecisive, says Sukanya Verma. Ever gone shopping with that annoying, indecisive friend who’ll try out a gazillion outfits but buy nothing? Sitting through Nikhil Advani’s Katti Batti is akin to the experience. Like your infuriating pal it cannot make up its mind as to what sort of romance it really wants to be. The upshot is an adrift, arbitrary, absolutely toneless flick that kicks off only in the last few reels dropping a last-minute bombshell. But the disclosure comes in so late in the day; even a sap like yours truly didn’t succumb. Katti Batti unravels in a series of flashbacks from strictly Madhav’s (Imran Khan) point of view. Still recovering from the heartbreak caused by the mysterious departure of his bohemian girlfriend Payal (Kangana Ranaut), he recalls how they met, flirted, turned live-in lovers and the reason she took off. When not in Mungerilal-mode, Madhav is desperately seeking Payal who’s all set to marry her ex-flame. Almost like a Rehna Hai Terre Dil Mein with a superior heroine, lesser hero and mediocre soundtrack (by Shankar-Ehsaan-Loy). Katti Batti has all the ingredients of a serviceable confection but it’s staggeringly blah, inert and muddled. One second he’s feeling her up, cut to them in a café. Also, the entire episode designed to parody Bhansali’s Devdas, despite its comic potential, ends up all too haphazard and amateurish. Absolutely nothing transpires in the first half, even the all-essential ‘meet cute’ is awfully stale, there’s no grand philosophy around their romance, no zing in the chemistry. Mostly it’s just a sloppy, loopholed hodgepodge of multiple themes. What starts out like a typical manic pixie dream girl taken in by awkward boy-next-door’s geeky charm rushes to study the priorities of new-age relationships around a live-in arrangement that has the potential to take shape into a war of the sexes only to wander into a probe of suicidal youngsters possibly suffering from multiple personality disorder. Still reading? Turns out it’s about neither of the above. Like I said -- infuriatingly indecisive. Katti Batti has a manipulative, melodramatic twist in mind; the sort of tissue-box mush Hollywood churns periodically, the sort that put me off Korean romances, the sort Advani didn’t fare too shabbily with early in his career. Immaterial, because by the time the filmmaker wakes up to, ironically, inject some life in the proceedings, disinterest looms large. Cannot imagine a worse fate for a love story that cannot get its audience to emotionally invest. Such a shame given how easily likeable its leads are. Perhaps Imran Khan’s dealt with far too many onscreen break-ups to render it freshly. One-note in his portrayal of the needy yet aggressive Madhav, he can neither convey the insecurities of a besotted man nor his passion. Plus, the poorly timed comic interludes -- the one where he pees over a Rs 5 lakh toilet seat evoke more cringe than chuckle. Advani’s insistence on contrived humour is intensely irritating. What’s even remotely funny about Imran’s South Indian caricature boss and his “Rama Lakshmana” enthusiasm? Kangana Ranaut’s radiant presence is the only silver lining to this tripe. One sees more vigour and variety in her hairstyles than the story. It’s never easy to play a character told entirely through someone else’s perspective but the savvy actress does her best to sparkle amidst unending silliness. Yet it’s criminal how Katti Batti squanders her abilities and takes the good will her recent work has generated to palm off ambiguous as avant-garde. For the sake of supporting cast there’s a scowling boyfriend turned business client turned groom-to-be, a token may or may not be gay best friend, a music band that offers unconditional support to the heartbroken in town, a nondescript daddy, a wheel-chaired mother, a nose-ring sporting kid sister adhering a fixed dress code of denim shirt and backpack and a tall lass in a conspicuous push-up bra. Too bad there’s not much to keep Katti Batti in place.